It’s easy to enjoy your time at Hotel Apartments Jacaranda, where on offer is a comfortable room with lots of essential facilities for the whole family as well as a perfect location from which to explore Protaras. Guests will find a clean and well-appointed room with all the essential amenities for relaxing stay. The hotel has two swimming pools, tennis and basketball courts for guests to enjoy. 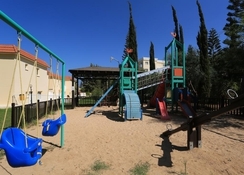 Children can have fun in the play area and in their own pool. There is also an entertainment programme that runs several nights a week that features live music, special themed buffet nights and folklore shows. Central Paphos is just 2km away where conveniences such as cash machines, food and retail shopping are to be found whilst family-friendly fun can be had at Cape Greco National Forest, Ocean Aquarium and the Magic Dancing Waters Live Show. Hotel Apartments Jacaranda is located in the beautiful region of Protaras. The apartments are located just 63km from Larnaca International Airport whilst the nearest beach is a 5-minute walk. The centre of Protaras is just 2km from the apartments. There are many top restaurants within an easy walking distance and these cater to both local tastes and those from around the world. There are several restaurants and bars located right on the coast affording visitors a beautiful vista whilst they dine. Family fun days out can be had at the nearby beach, the Ocean Aquarium whilst an evening out at Magic Dancing Waters Live Show is a must-see. 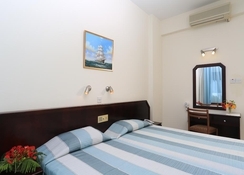 Rooms at Hotel Apartments Jacaranda are clean and simple yet comfortable and provide essential facilities such as air-conditioning, safe deposit box, T.V., wi-fi, telephone and provide views over either the sea or swimming pool from a balcony or veranda. There are two room types. Studios feature an open-plan lounge with twin beds. One-bedroom apartments come with a twin bed and a kitchenette for dining in. Guests can upgrade to a Superior Apartment if they wish where they will also get access to a toaster, coffee machine and microwave. 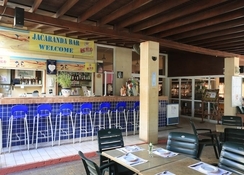 The main restaurant at Hotel Apartments Jacaranda is located by the pool and operates during the summer months. It serves internationally recognisable favourite dishes as well as offering a taste of local Greek and Cypriot cuisine. Between main meals, snacks are also available. The pool bar is a great place to relax with a drink, choose from a great selection of beers, wines and cocktails. Outside of the complex, there are many more dining options. Fine Italian can be has a Nautilus Trattoria, authentic Greek at El Greco and succulent burgers at Sizzler’s Steak and Flambe House. Enjoy a beer or cocktail out at The Lounge Bar, Enigma Bar or Mexican Ranch Bar, all close by. Leisure activities at Hotel Apartments Jacaranda include two swimming pools as well as a separate shallow pool for children and a baby pool. Guests will also find a pool table, tennis court and basketball court to keep active at. Little ones will love the children’s play area. Alternatively, pull up a sun lounger and relax on the sun terrace. Great family fun is put on on a regular basis through the entertainment programme. These might include special evenings with folklore shows, live music and themed buffet nights. Out in Protaras itself take to the golden sands and Mediterranean waters along Kalamies Beach. The whole family will love visiting the Ocean Aquarium during the day and Magic Dancing Waters Live Show in the evening.